Monsters captivated the imagination of medieval men and women, just as they continue to fascinate us today. Drawing on the Morgan's superb collection of illuminated manuscripts, this major exhibition, the first of its kind in North America, will explore the complex social role of monsters in the Middle Ages. 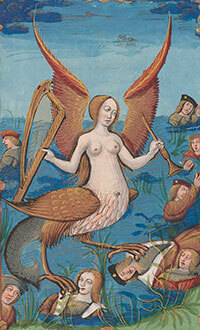 Siren, from Abus du Monde (The Abuses of the World), France, Rouen, ca. 1510. New York, The Morgan Library & Museum, MS M.42, fol. 15r.